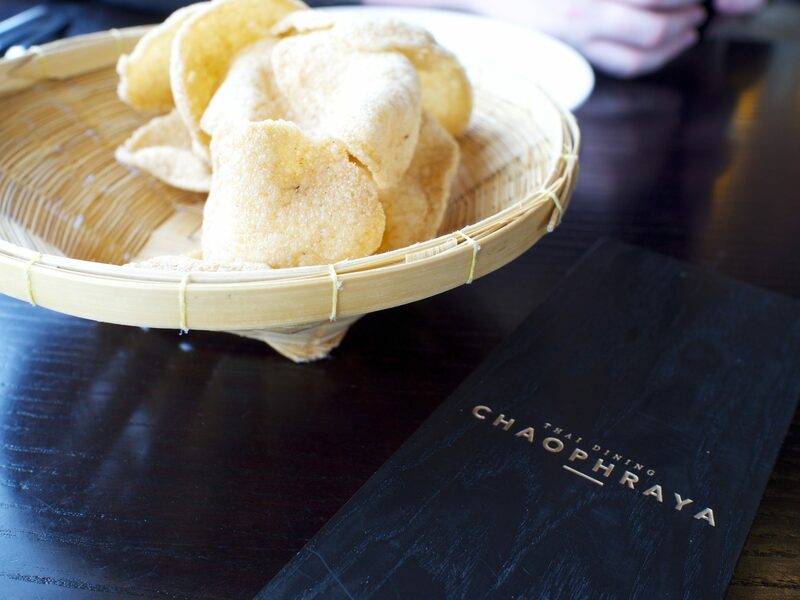 We continued our quest to conquer Newcastle’s culinary scene recently with a trip to Chaophraya. 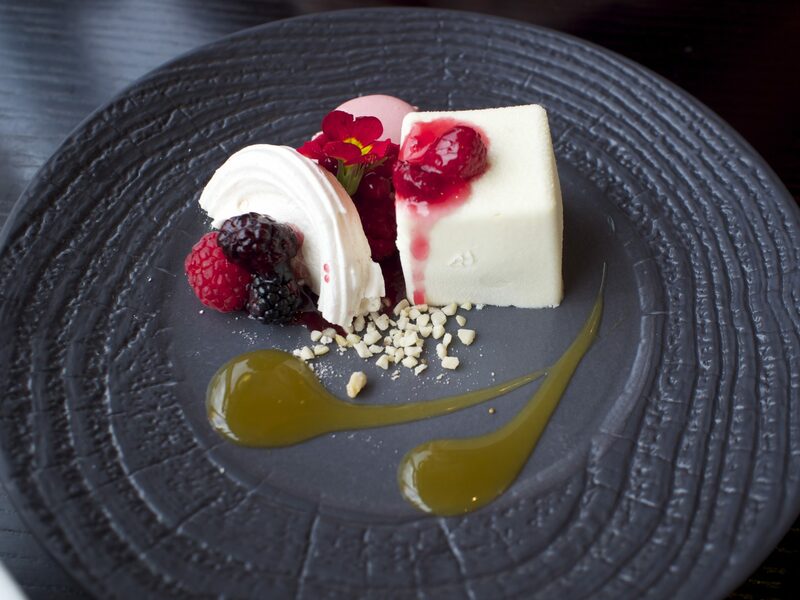 Billed as ‘Thai fine dining’ and occupying a much coveted spot in the new bit of Eldon Square, we were excited to check out the views and the food on offer. My good friend S was visiting from Edinburgh where they also have a Chaophraya. 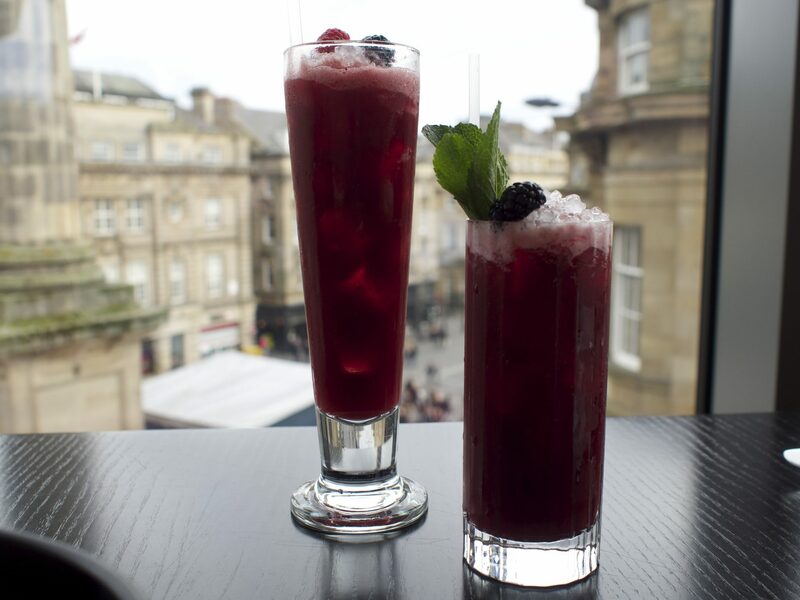 The small chain of restaurants picks the best spots in every city to ensure they all have the wow factor, so in Edinburgh you get views of the castle and in Newcastle it’s Grey’s Monument and Gallowgate. We arrived at one of their reception areas and a there wasn’t a member of staff there we made our own way upstairs (they have two receptions, one of which has a lift). 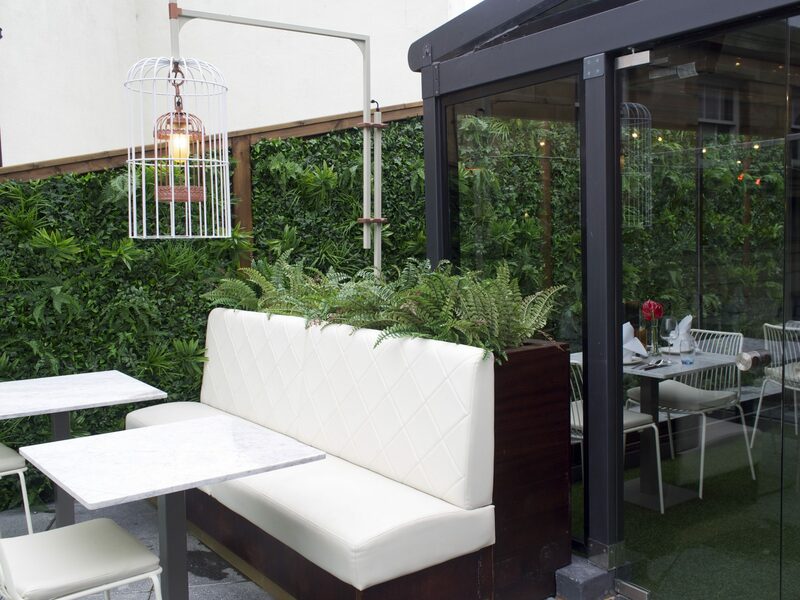 The restaurant is split into sections, the main area has views of street below and there is also a glass covered ‘outdoor’ area, a small terrace and a private dining area. All very high spec with no expense seemingly spared and the staff are dressed in beautiful traditional (I’m guessing) Thai outfits. The restaurant was experiencing a bit of a heatwave, no-one else seemed too bothered by this but S and I were immediately struck by the temperature – maybe this is to emulate Thai weather? A couple of degrees lower on the aircon would’ve made it a little more comfortable in our opinion! 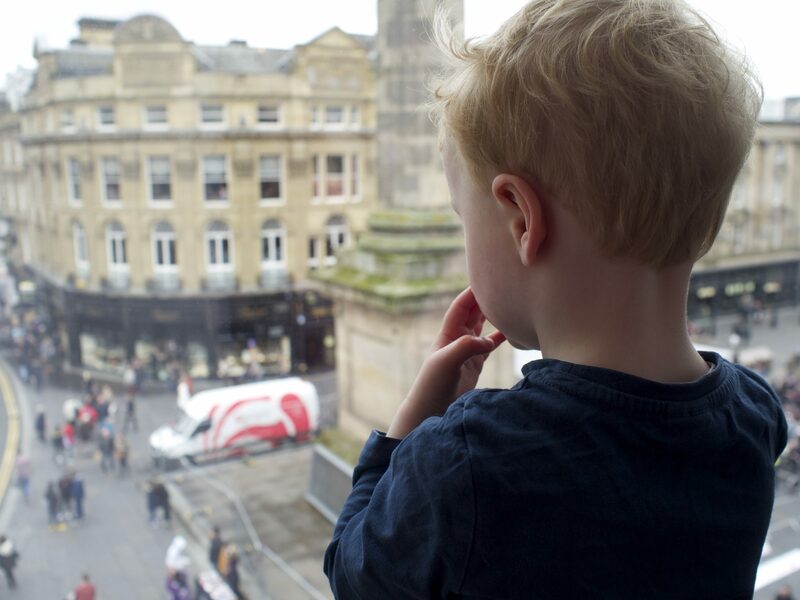 We were seated overlooking the monument, which was great for Little Dude as he could stand and look out the window. It’s all about the distractions with toddlers! S kindly ordered us a couple of rose royale cocktails (Royal Orchid prosecco and Lanique Rose liqueur £8.50) which arrived with a sprig of heather in them. 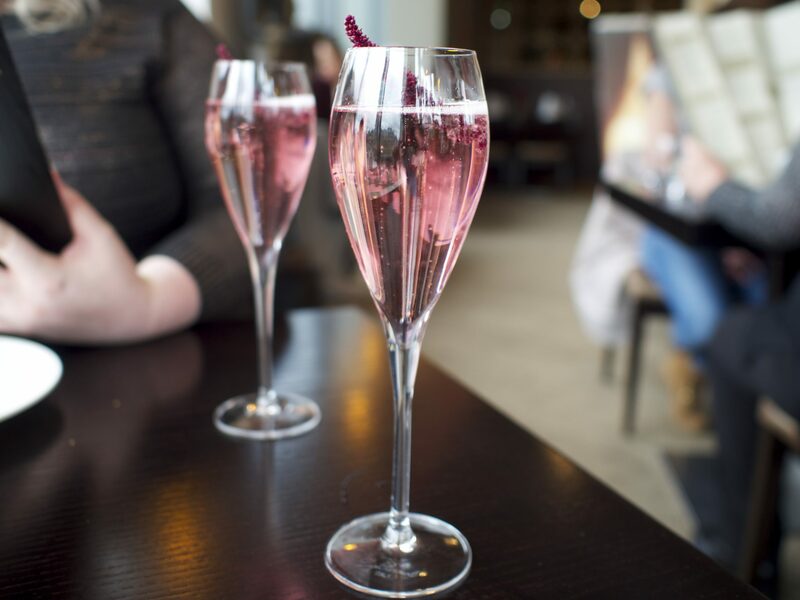 The rose liqueur added a nice fragrant flavour to the superb prosecco without making it too sweet and was a great start to the proceedings. A basket of thai prawn crackers and sweet chilli sauce with a little more of a kick than normal were promptly delivered to our table while we perused the menu. On a Saturday lunchtime the place was filling up with a lot of ladies with Fenwicks bags and one classy hen do as well as a couple of families. I’d imagine there would be more of a mix in the evening but it seemed to be the ‘ladies who lunch’ crowd at this time of day. We ordered a sharing platter from the extensive menu, letting our immaculately turned out waitress help us to pick which one. 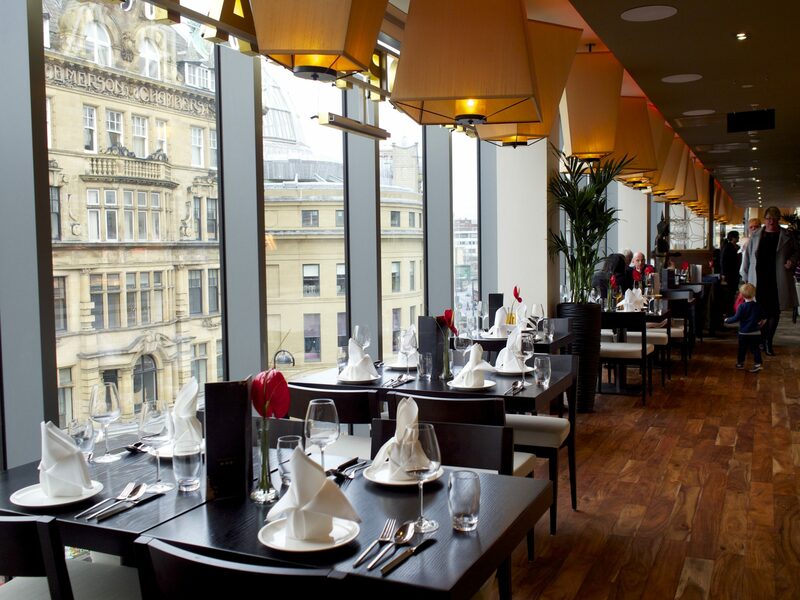 We ordered from the a la carte as it was a Saturday but Sunday to Thursday they have a daytime special until 5pm where you can get two courses for £13.50 or three courses for £18.50. 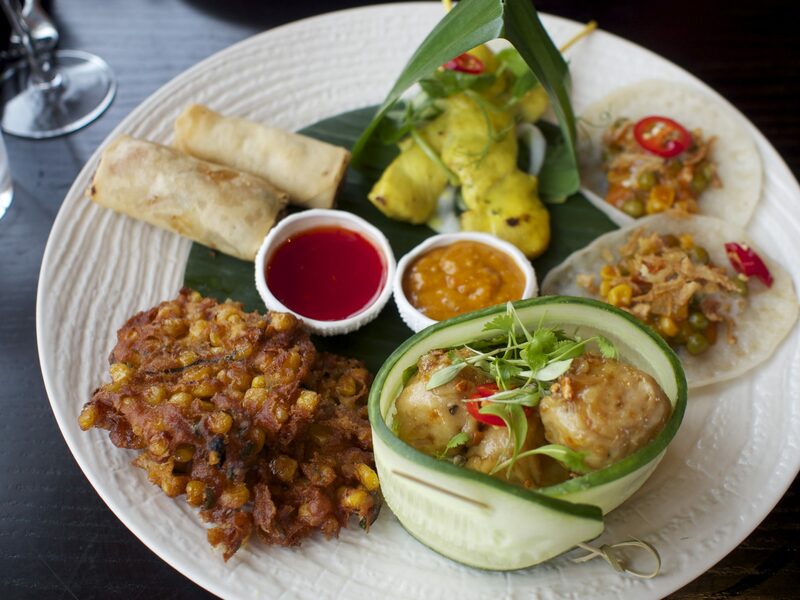 We’d chosen the Maeklong platter – a classic starter selection of chicken satay, prawn and pork dumplings, chicken spring rolls and sweetcorn cakes (£9.50 per person, minimum of two people). It arrived with the added bonus of Thai vegetable tacos on it too, which were delicious and S’s favourite component with delicate thai curry flavours and a soft taco shell. The dumplings were delicious especially when combined with fresh coriander and the sweetcorn fritters went down a treat with LD especially. Decent spring rolls and chicken satay skewers too, with a very good peanut sauce. We arrived back at our table as the mains were served. 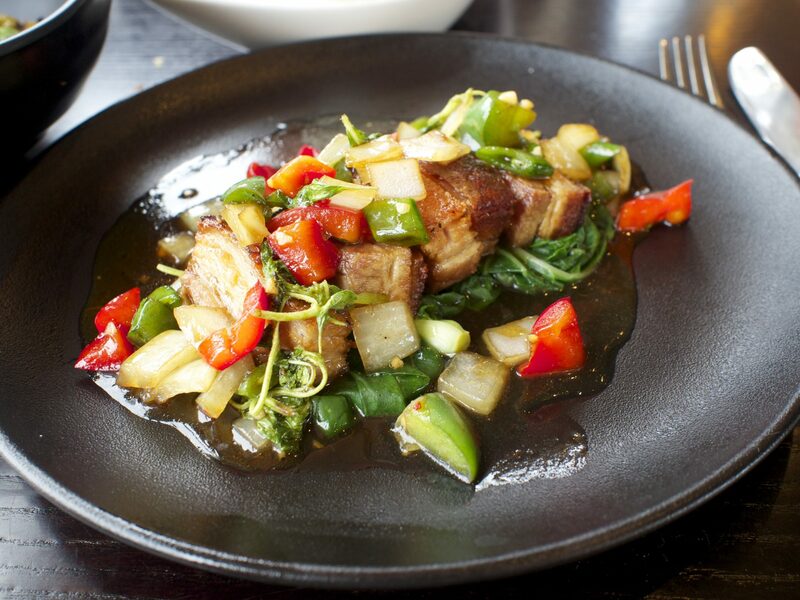 I’d gone for crispy pork belly with Thai basil which is served with sugar snap peas and peppers tossed with fresh chillies, garlic and hot basil leaves (£12.50). It had two chilies next to it in the menu and I asked for it to be a bit milder with a little kick (more like one chilli) as I know Thai food can blow your head off. I ordered jasmine rice (£3) to go with it, out of an assortment of rice and noodle options. The dish arrived looking beautiful and I tucked into the pork which was exquisitely cooked, crispy skin on top with tender meat. Even the fat tasted delicious, which is normally the bit I leave. The sauce complimented it beautifully, with that sweet and savoury Unami taste that keeps you coming back for more. The kitchen had erred on the side of caution and it didn’t have any spice to it but I can’t imagine it tasting any better if it was spicy, so I wasn’t too upset. 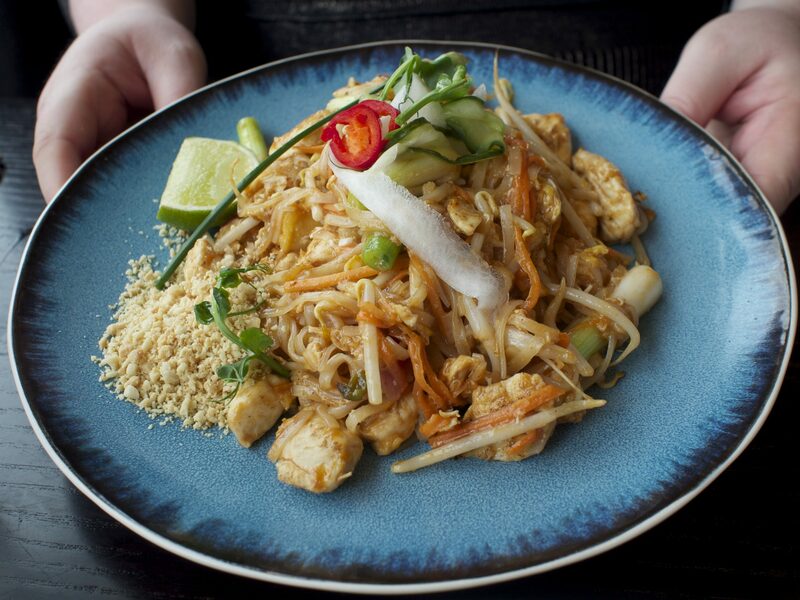 S had plumped for Thailand’s National dish – Chicken pad thai. Stir-fried rice noodles in tamarind sauce with chicken, spring onions, carrots, egg, tofu, sweet turnip and bean sprouts, topped with lightly pickled vegetables (£10.50). Always the test of a good Thai restaurant, this one went down well with S after she’d squeezed the lime over it and mixed in the crushed peanuts. I had a taste and it was a good specimen with the right balance of tamarind sauce to veg, meat and noodle ratio. 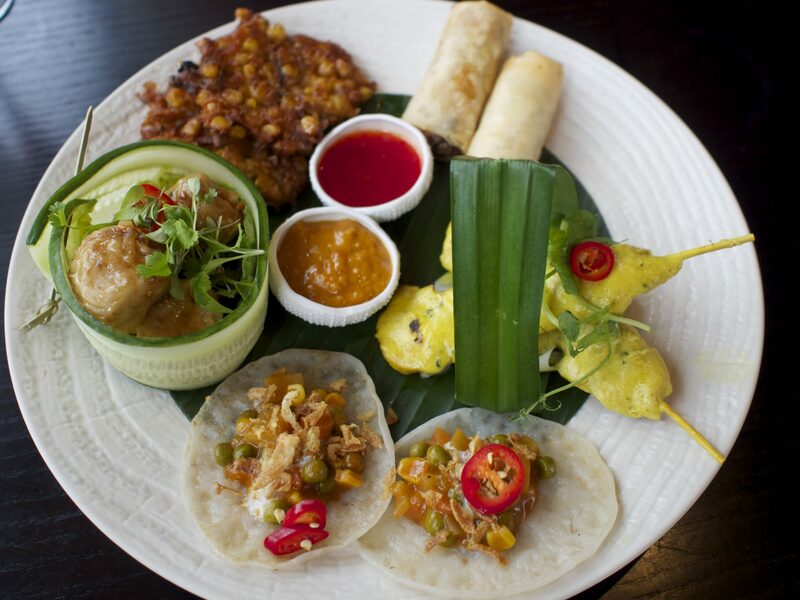 For LD I’d selected chicken satay from the kids menu – bamboo skewers, grilled over charcoal and served with homemade peanut sauce and vegetable relish (£4.50). It was a decent portion and also beautifully presented with the peanut sauce served in a carved out chunk of cucumber. It wasn’t spicy so perfect for kids and LD enjoyed chomping away on the skewers. He had some of my rice too as his didn’t come with any. S ordered us another couple of cocktails, a Chit Lom (Goslings black seal rum, Creme de Mure, apple, blueberry and lime £8) for me and a Mai Mao (mango juice, lychee juice, raspberry, strawberry and blackberry £5) for her as she was driving. Both were delicious, you couldn’t taste the rum in mine which made it go down a little too easily! 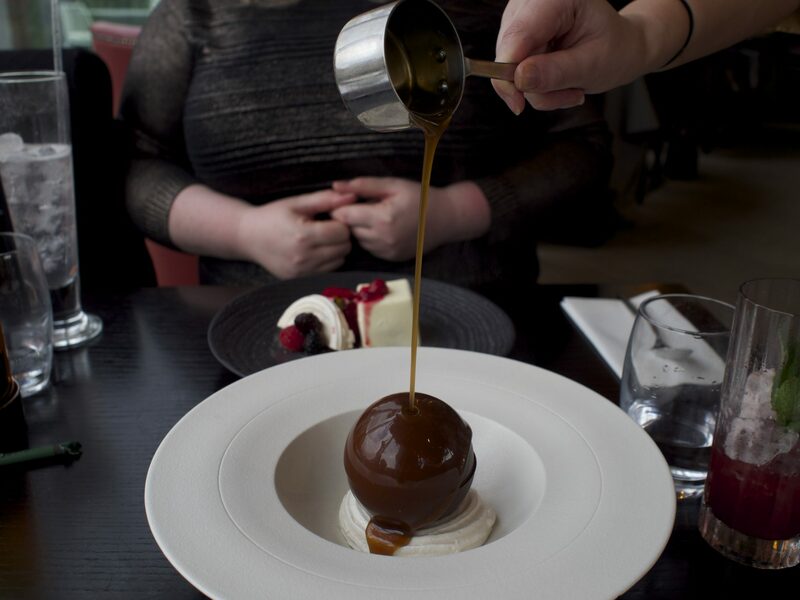 I decided to treat myself and ordered the melting chocolate bombe that we’d seen served to the people at the next table. It came with Thai whiskey ice cream, honey and toasted sesame popcorn centre with hot caramel sauce (£7.50). S went for the white chocolate mousse with raspberry coulis on butter shortbread served with a mini macaroon and passion fruit syrup (£7.50) and I ordered LD strawberry ripple ice cream (£3) from the kids menu. The chocolate bombe is obviously a bit of a gimmick at the moment but I have to say it added a sense of occasion to proceedings. 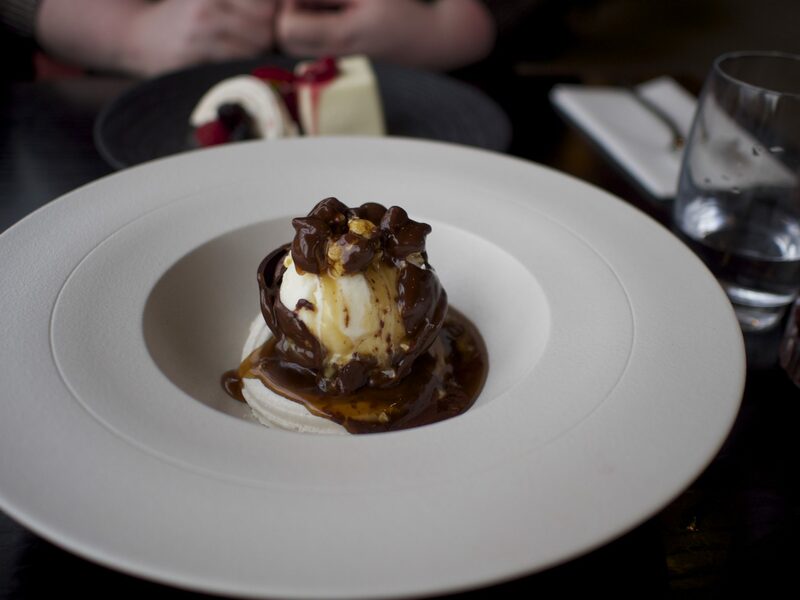 I’m all for a bit of fun and theatre when eating out and it tasted good too, the whisky ice cream was quite strong but when combined with the caramel sauce, chocolate and popcorn it was a deliciously indulgent pud. S’s very pretty chocolate box dessert tasted as good as it looked, perfect for chocolate lovers who want something a little different. We hadn’t gone for the traditional Thai desserts but this place is about fusion and indulgence so these desserts were just right. 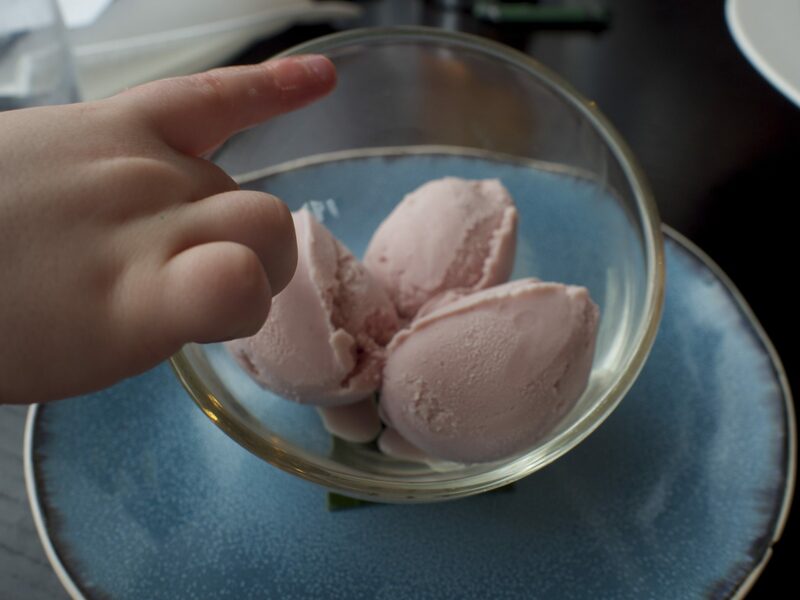 LD’s ice cream went down well (once we’d managed to get hold of a teaspoon – kids size tableware is always tricky to track down in a restaurant) but there wasn’t a ripple in sight, it was a perfectly decent strawberry ice cream though and the portion was generous – more than LD could handle! 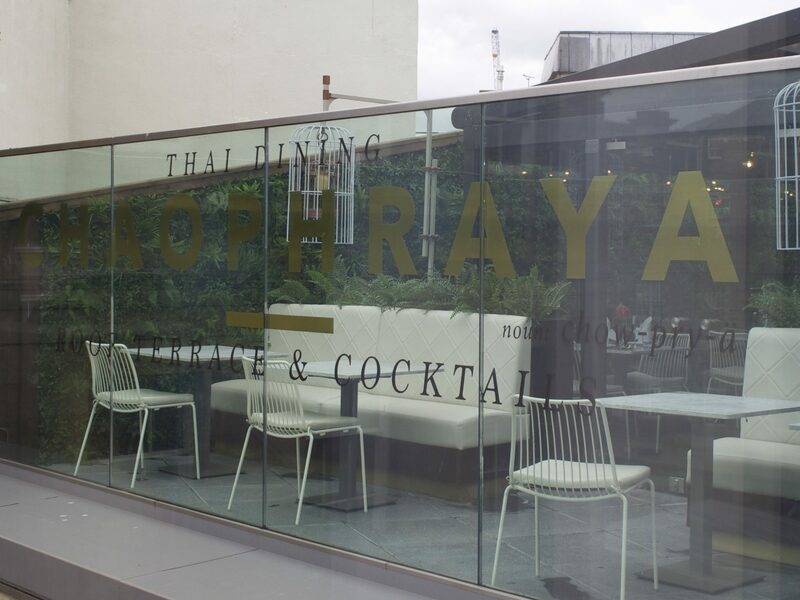 All in all I would say if you want a nice thai fusion meal in luxurious surroundings then Chaophraya is for you. Street food it aint, so don’t come expecting the ‘real’ (faux) Thai experience. 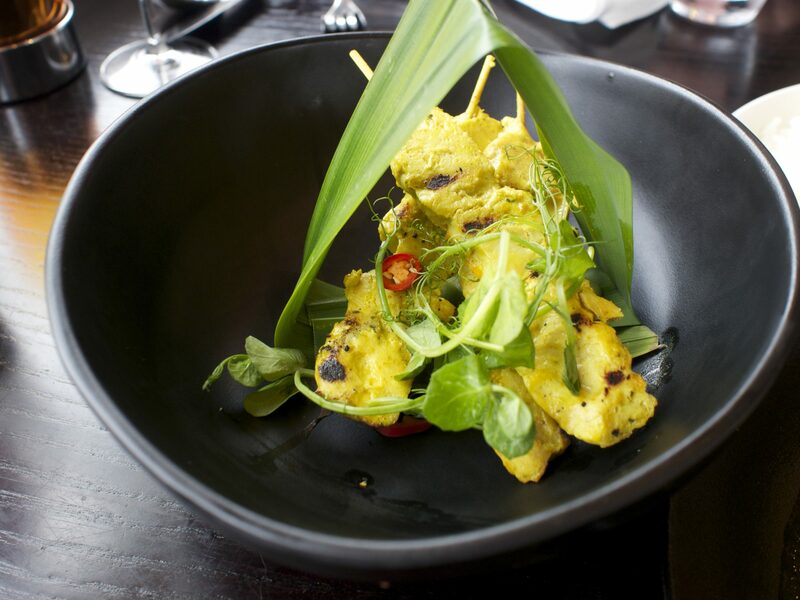 It’s more about treating yourself and tasty takes on Thai dishes with fantastic views over the city. 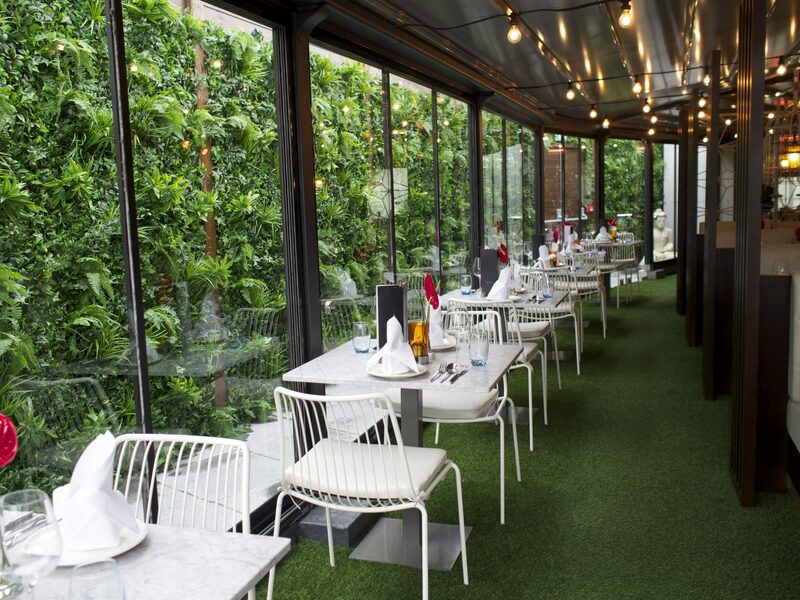 We’ll be back to check out that roof terrace in the summer! Thanks for reading! Follow us on Twitter, Facebook and Instagram for updates. 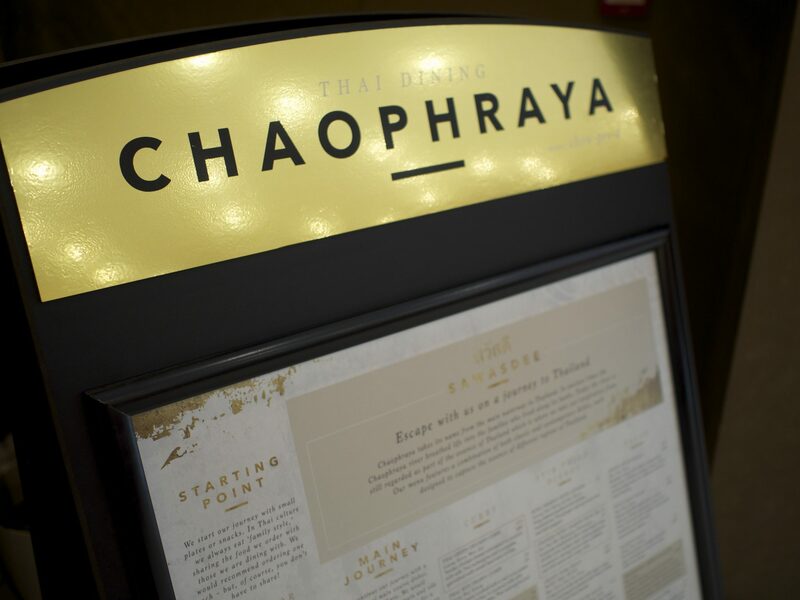 Chaophraya is located in Grey’s Quarter, intu Eldon Square, Newcastle upon Tyne NE1 7AP. We were provided with complimentary food for the purposes of this review and we paid for our own drinks (well S did! Thanks S). As ever the opinions expressed in this article are honest and true to experience.